The 'Violet' chair features a minimalist design and is well conceived in its essentiality. 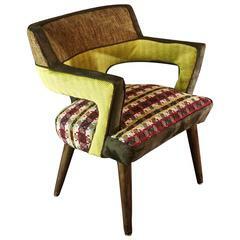 The frame is made of metal and the upholstery is in velvet. 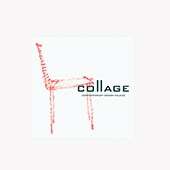 The metal frame is curvy both in the legs that support the seat and the armrests. The result, with very few traits, is a rich and harmonious design. The small seatback is adjustable allowing greater comfort. The seat and seatback are available in velvet in different colours: orange, red, blue, beige, black and white. The metal frame is in black color. 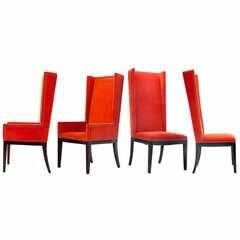 Unusual metal frame chair with orange vinyl pad seats. Please view the matching large sofa we have listed from this stylish set. Attributed to Woodard Furniture. Two armchairs an two armless chairs, orange velvet with nailhead trim. These are showroom models with each base slightly different than the next. A stunning quartet!